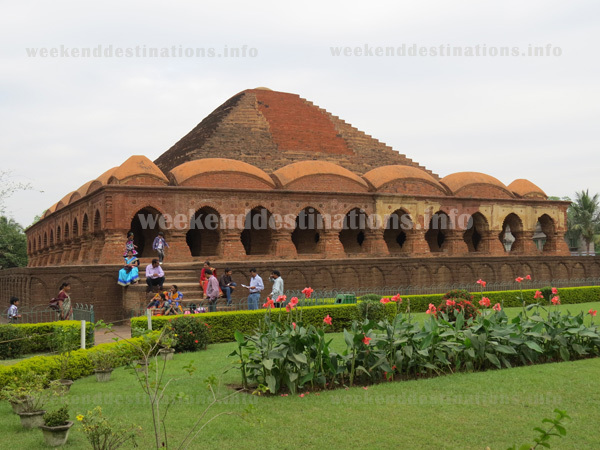 Places to see at Bishnupur: You can go for sightseeing of the various terracotta temples in the morning or at night on Saturdays and Sundays when the temples are illuminated with special lights. Plus, you can take a cycle rickshaw and move around the town and see some of the popular spots like the temple of Ramkrishna and Shyamrai, Madanmohan temple, Gardorja, Jor Banglow temple, Radheshyam temple, Dolmadol Kaman, etc. The Jorbangla Temple of Keshta Rai is worth seeing. The beautiful carvings of terracotta are still intact. Pancha Ratna Temple, also known as Shyamrai Temple, was built in 1643 . Walls of this large temple flaunt terracotta carvings depicting Lord Krishna’s life. 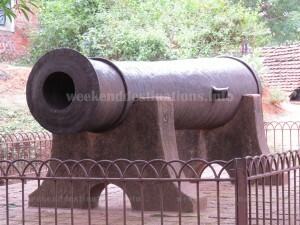 The famous Dalmadal Kaman (cannon) made of wrought iron was probably the largest cannon manufactured by the Malla Kings. The cannon is 3.8 meters long with a muzzle of 29.2 cms in diameter. This canon is worth a visit. 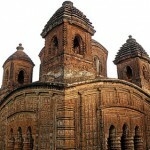 The Madanmohan Temple of Bishnupur follows ekaratna style that has a square flat roof with carved cornices. The building also has a surmounted pinnacle on top. The walls of this temple depict a few scenes from Ramayana, Mahabharata and the Puranas. 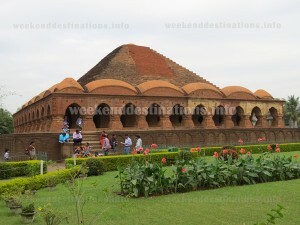 Rasmancha is the oldest brick structure here, made in a pyramidal structure. During the Rasa Festival several deities from other temples are brought here, in a procession. Some of the cannons used during the reign of Malla kings are still kept here. 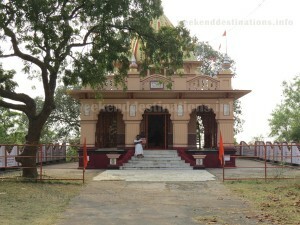 Lalji Temple is a laterite eka-ratna temple. The temple stands over a square raised plinth, having ornamental stucco decorations on low relief carvings. Nearby attractions of Bishnupur: You can visit Siddheswar Siva temple at Bahulara (25 kms from Bishnupur), the 900 year old Saileswar temple (8 kms from Bishnupur), the Panchmurah Village (10 kms from Bishnupur) where the famous terracotta statues are made and the riverside resort of Mukutmanipur (82 kms from Bishnupur). Bishnupur is also famous for Baluchari saris, so look for some shops that sell good baluchari saris. Traditional version of these saris is woven with Ramayana and Mahabharata images. 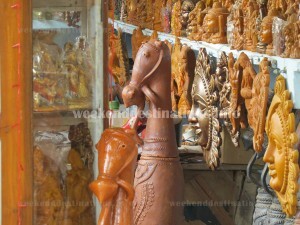 If you are willing to buy some terracotta stuffs then visit the shops or visit Bankura for the famous terracotta horses. The hilltop Temple of Kapistha is located around 60 kms from Bishnupur. It is an ideal place for travellers seeking remoteness and peace. Non-veg food is not allowed around Kapistha temple (even onion and garlic). There is a white marble idol of Goddess Parvati in the temple. The ruins of the erstwhile Jamindar house can also be found here. Other nearby attraction are the birthplaces of Sri Ma Sarada Devi and Sri Ramakrishna Pramahamsa at Jairambati and Kamarpukur (43 kms from Bishnupur) and climb Susunia hills. 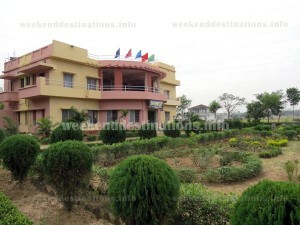 The district headquarters town Bankura is only 30 kms from Bishnupur. Things to do at Bishnupur: Apart from sightseeing of the different places of attraction, you can also visit the Bishnupur fair which takes place from 23rd to 27th December and shop for Baluchari sarees, decorative items made of burnt clay and handmade Dashavtaar Cards. Moreover, you can take a stroll and enjoy the natural beauty of Bishnupur. How to reach Bishnupur: By train, it takes 3 hours and 45 minutes to reach Bishnupur from Howrah. The regular trains connecting Bishnupur to Howrah are Purulia Express departing Howrah at 4:45 pm, Rupashi Bangla Express departing from Howrah at 6:00 am and Howrah – Chakradharpur passenger, leaving Howrah at 11.05 pm. Aranyak Express leaves Shalimar at 7.45 am. You can also come by train to Kharagpur/ Midnapur/ Bardhaman/ Durgapur from Howrah and finally take the bus journey. By bus you can reach Midnapore at first and then take local buses that are available every 30 minutes to reach Bishnupur. However, by road, it generally takes a little more around 4 hours from Kolkata. You should take the Expressway to reach Baidyabati crossing (more). From there, you must take left and travel some 151 kilometer via Singur-Halikut-Bashdeopur-Tarakeshwar-Rashulpur-Arambagh-Kotalpur. Best time to visit Bishnupur: Usually throughout the year but if you want to attend the Bishnupur fair, then you must go sometime between 23rd and 27th of December. Snake festival takes place in August, which is also very popular here. Bishnupur celebrates festivals like Durga Puja, Kali Puja, Diwali and Holi (dol) very brightly. However, Bishnupur has a warm climate most of the time; so, it is suggested to enjoy this place during winters. Lodging and dining facilities at Bishnupur: There are plenty of private hotels and lodges available in Bishnupur with AC and Non-AC rooms. Generally, dining facilities are available in almost all hotels and lodges. Some of the hotels also have multi-cuisine restaurant.